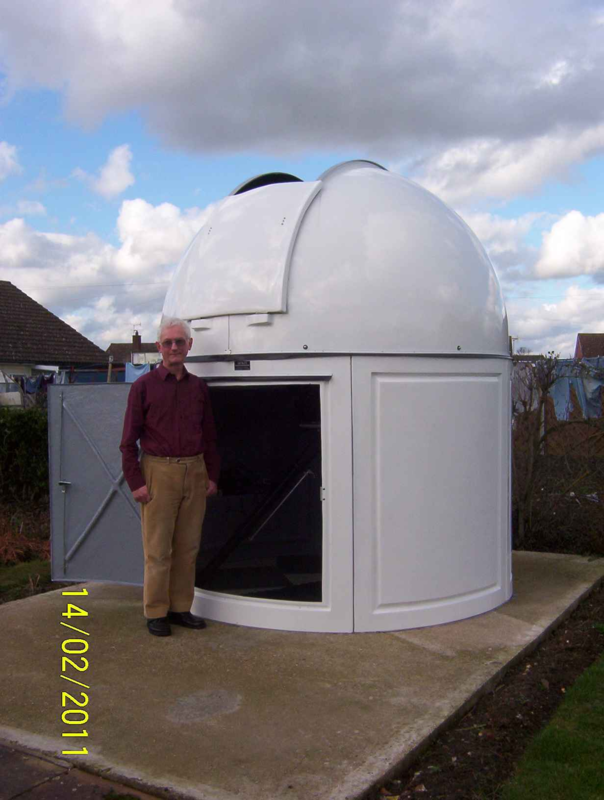 The Plymouth Astronomical Society (PAS) was formed on 25th February 1965 by Lawrence Harris who was then a student at Plymouth College of Advanced Technology (now the University of Plymouth). What follows has been written by Lawrence in 2013 recalling his personal memories of those early days. I attended Widey Technical School at Crownhill in Plymouth between 1958 (when it was based in Armada Street as the Junior Tech) and 1964 (by which time it had transferred to a new school). During these years I discovered an ancient telescope (10-inches diameter) in the school loft, complete with optics. 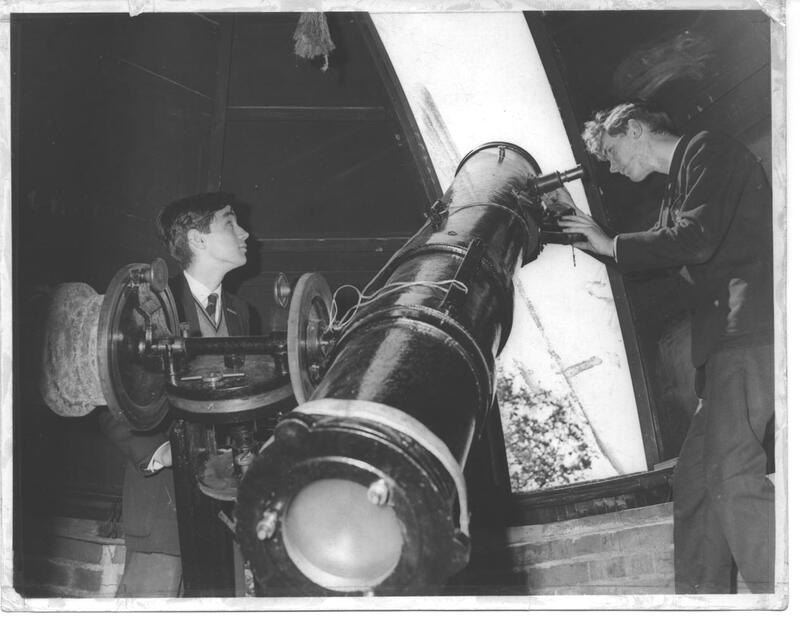 Following discussion with the headmaster (Mr Edgar Harris) the telescope was transferred manually to a tiny observatory hastily built in the school grounds to impress a visiting government minister. (Isn’t it strange, the things you remember!) After much hassle I was able to get the telescope operational after the headmaster had (apparently) paid for the silvering of the mirror. I organised an astronomy club for the school and we met each week. I wrote to Patrick Moore for advice about becoming a professional astronomer and he subsequently visited me at home for a chat. We also drove to the school observatory. 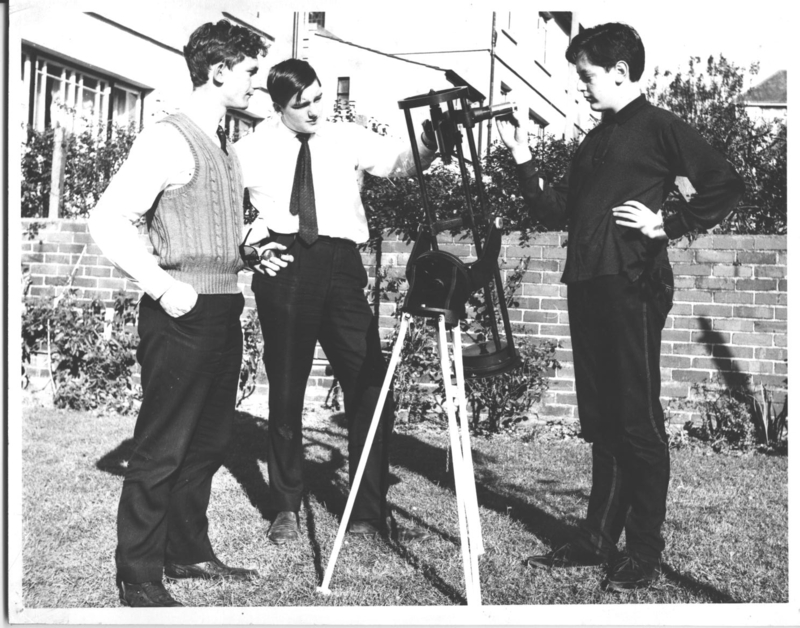 Plymouth Astronomical Society founder Lawrence Harris (right) with the telescope at Widey School. Patrick Moore visits Widey School. 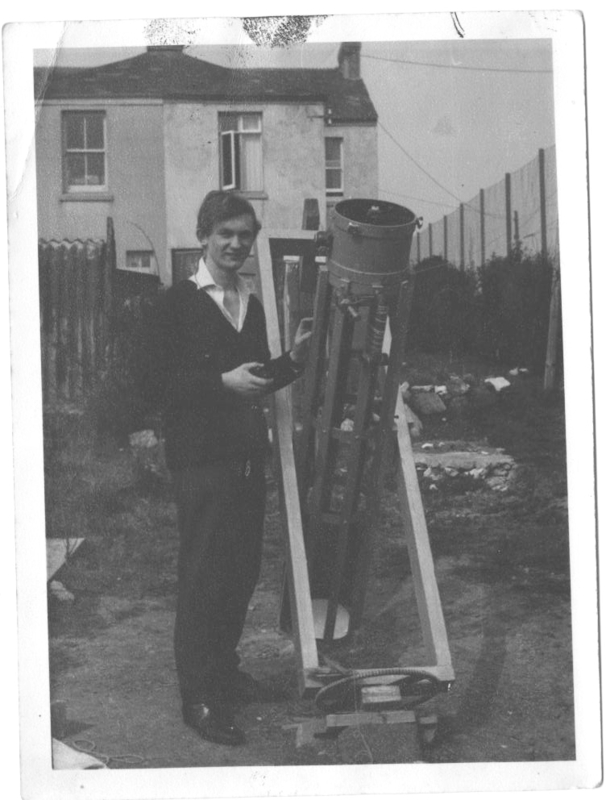 Lawrence Harris in 1964 with his home-made reflector. I left in 1964 to attend Plymouth College of Advanced Technology (the precursor to the university). During this time I had been able to set up my own telescope at home, an 8.25-inch Newtonian reflector and did some observing whenever possible. There was a scheduled total eclipse of the moon that December so I decided to take some pictures. On the evening before the eclipse I took some test images by simply holding my SLR camera up to the wide-angle eyepiece. I varied the exposure and rattled off a film. Next day I developed the film and was relieved to see a string of good images! We had the Herald delivered daily so I gave them a ring and told them my plans for the eclipse. Later that day they came out to take some pictures of my scope. This was rushed out the same day – the edition before the eclipse. Feeling an unexpected responsibility for actually getting the pictures I determined to complete the job. The weather was kind (!) and I was able to take as many pictures as I could handle. The Herald had requested that I took the developed film to them for printing in their offices so I set off after having a few hours’ sleep. Their editorial photographer selected two pictures for which I provided captions. Later that day the Herald appeared and my pictures were on the front page. Lawrence's pictures on the front page of the Herald. It was only a few days before I unexpectedly started to receive letters from Herald readers. Several people asked whether there was a Plymouth Astronomical Society. I visited central library to enquire but they confirmed that there was no such society known to them. Apparently one had existed several years previously but had folded after a short time. On the morning of 25 February, I had a call from the local BBC TV asking for Sylvia and me to appear on the 6.30pm Spotlight South-West to talk about the Society. We agreed. Immediately following the programme they delivered us to the venue by taxi. To my relief, there were people waiting at Raglan Barracks, Devonport for the meeting. Sylvia’s father had contacts there and they permitted us free use of the hall for the evening. So a total of about 9 people met there. A rather nervous 19-year old, at 7.30pm I introduced the Society with just Peter and Sylvia at the front. Those attending agreed to vote the nominated committee to hold the posts for a year; contact names and addresses were collected. Back at College I spoke to my physics tutor and he immediately offered the free use of a College room on Thursday evenings until 9pm. All later meetings were held there, and we had free use of blackboards! Committee members Lawrence Harris (left), Barry Smith (centre) and Alan Frost (right) in 1965. Membership of the Society quickly grew to about 30 – 40. At the end of each monthly meeting I sent a report of meeting highlights including talk summaries, and this was invariably published. I still have many of these press cuttings. I also found myself interviewed periodically concerning all space and astronomy matters. The Space Race was in full flight and reporters were always seeking a local perspective. There was no ‘expertise’ in astronomy or space at the College so I was perceived as ‘the contact’ although technically it was my hobby. A number of BBC television interviews were had on topics such as a current comet and of course UFOs! Significantly for me, I was paid for radio and television appearances (3 and 5 guineas) and this was about 25% of my (tiny) student grant. An early effort was made to produce the Society’s first copy of a magazine. In those days (1965 and 1966) copying was normally normally done on a Banda machine. One of the members (a young Chris Bollard) had access to such a copier so we produced a two-sided sheet. It required typing (hammering!) the text on to a stencil and then running this through an ink tray. Many messy hours were spent putting it together! Copies were handed out at the next meeting and I retained one copy. I still have that copy ! We decided on the name Orion so that became Edition 1. This early edition did not carry the name Orion because we had no means of doing large text. During those years (1965 February until 1968 May) I can’t recall a single problem committee meeting. We experienced 'staff' turnover from an early stage when the original secretary left, but otherwise things were very stable. I can only recall a very positive atmosphere at all the PAS meetings, and the fact that the membership number remained very good, varying between 30 – 45 for a long time. 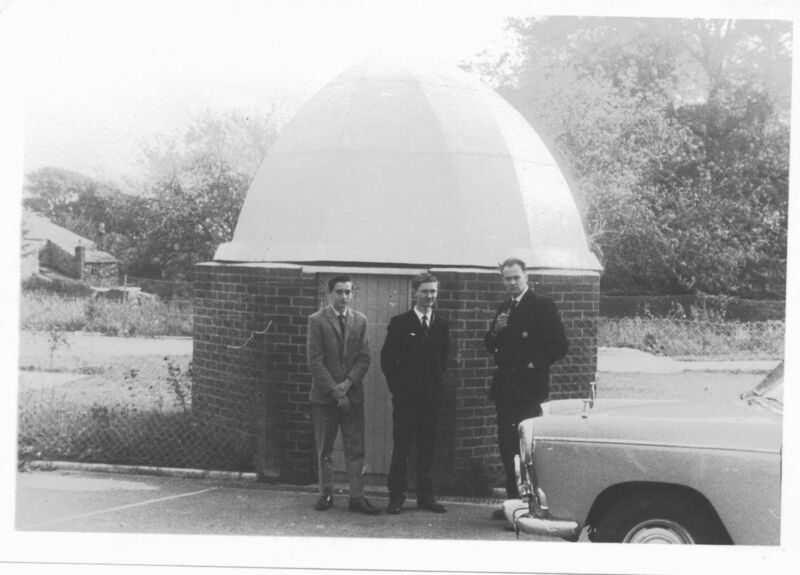 Peter and I organised the first PAS trip – to see Hedley Robinson’s observatory in Teignmouth. Hedley was a friend of mine and was the director of the Mercury and Venus section of the BAA. The Space Race and the Herald’s positive attitude to our Society helped enormously. Eventually my College course came to an end (somewhat after my grant!) and I announced my departure at the May 1965 AGM. I recall Geoff Pearce presenting a cake made especially by his wife. Happy days! The post of President was abolished and Geoff went on to become Secretary for many years after I left Plymouth. 1985 – The wanderer returns. During the years 1968 to 1985 I exchanged an occasional letter with Geoff who kept me up-to-date with PAS matters. He had taken on the role of observation secretary but had also gained a deep concern about political events in Europe and their effect on families in other countries. I became aware of his regular European trips. A PAS member had taken over his post and organised a new committee. could be changed. Because of my earlier friendship with Patrick Moore, I was able to persuade Patrick to visit Plymouth to address the Society in a public venue. We paid for Patrick’s local expenses and the income from ticket sales covered our own expenses. An annual quiz in December led an associate member to decide to award a trophy to the winning team. For some years between 1990 and 2002 the Plymouth Evening Herald published a monthly guide to the night sky written by me and forming an opportunity for regular mentions of Society activities. Craig Rich (BBC local radio) arranged for me to provide a monthly chat about current astronomical events, also helping publicise the Society’s activities. The committee was able to produce a regular copy of Orion over a long period. The effort put into these activities by the committee should not be underestimated. In the earliest days we had great support from the College of Advanced Technology. Times have changed considerably from those days. Another long serving committee member has been Sheila Evans originally as Secretary. Sheila was tireless in her efforts, also attending external meetings on behalf of the PAS. Alan Penman joined the society and soon volunteered to help the Committee. He and I spent many hours dealing with external events and organising the meetings. Special mention should be made of the Lottery Award given to the Society in February, 2000. This was largely as a result of Alan’s near solo effort in applying for the grant and dealing with the associated mountain of paperwork. During the years up to 2001 the Society had a fairly stable Committee with few changes. By 2000 it became clear to me that family commitments would be better served by Marion and I moving nearer to London. In July 2001 we moved to Southampton. Others would need to continue the history of the PAS from that time. 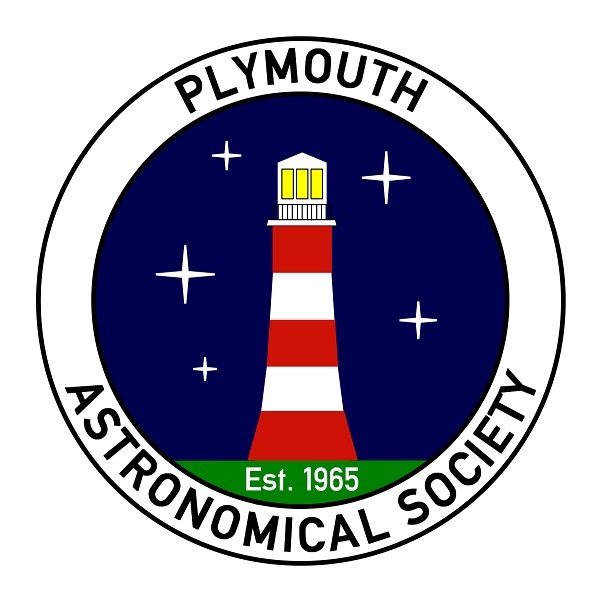 The original idea of forming the PAS was to provide Plymouth with a society in which people with an interest in astronomy could meet regularly and provide mutual support. I hope that Plymouth can continue to provide people with this common interest and amongst the membership will be folk ready to volunteer their time and expertise. In 1990 after the resignation of Sheila Evans who had done a valiant job in post for some 8 years, a new Secretary was formally elected. Alan G. Penman became the new Secretary and during the following two years Alan and I sometimes swapped posts as Secretary and Chairman. Alan also became the BAA’s CfDS Officer for South Devon and as a result of working with a very sympathetic City Lighting Engineer (Norman Emmett), attending lighting symposiums in Bournemouth and Birmingham, the City of Plymouth was literally relit and is a very different place today. We will never be able to thank Norman Emmett enough for his forward looking approach to the city's lighting. Ever since that time the Plymouth Astronomical Society has enjoyed a steady and stable existence. More recently the Society has consolidated its relationship with Plymouth University and meetings are now held at the University. a strong interest in astronomy.